Who doesn’t love opening a box? The possibilities for what’s inside are totally endless. Headphones? Shoes? Makeup? Build up the anticipation even more by using a box that grabs attention. Maybe it’s an unexpected size, maybe it’s a unique shape. Maybe it’s a color so wild it stuns everybody. So, how do you find a box like that, you ask? You make it! Designed by you, and made by The Packaging Company, custom boxes will stop people in their tracks and get you noticed. You’re making this one yourself. You’re the Picasso of boxes. The Rembrandt of corrugate. Your new custom corrugated box is just a few digital paint strokes away—that is, just a few clicks away. It’s so easy, you don’t even need to read any instructions. You already know how to use it. That new box really is all about you. Now’s your time to shine. ‘Cause when we say DIY, boy, do we mean DIY. Want something standard? A regular slotted carton (RSC) is always a reliable choice, perfect for almost anything you’re going to put inside it. Looking to have a little more fun with it? Make an impression with a front locking mailer (FLM). There’s no better way to reveal a product or gift. And you know what’s even better? Those aren’t your only box style options. Just 1 box for a special present? Easy! 50 boxes for gifts at a family reunion? We got you. Sending out a monthly subscription box for cheese? comic books? … socks? Oh boy, are you done. Are shipping out snow globes? Sweet, there’s a box for that. Mailing out sweaters or pants? Sure, we’ve got you covered. Books? Absolutely—and also? Go you and your love of reading! There is a sizing minimum, but we’re confident it’s still compact enough for anything you’re planning. You get to play with the numbers. You get to name your budget. There are no hidden costs, no set-up fees to cover, no cutting dies to pay for. And perhaps best of all, there are no minimum production numbers. See? We weren’t kidding when we said DIY. Boxes Gone Wild – With Color! Let’s be honest. When it comes to designing a box, nothing beats color. Not the size, not the shape, not the style. Nothing. Box color is all the rage these days, and in the world of e-commerce it’s basically a must. That’s why the custom boxes you design with The Packaging Company have 2 sides to customize. Outside Color lets you maximize visual impact. Stand out in a sea of brown cubes and build up excitement with a bright, vibrant box. Like the briefcase in Pulp Fiction, you’ve just got to know what’s in there. Inside Color means you can create the perfect unboxing experience. No matter the color outside, nothing can prepare someone for what awaits them. Every one of our colors comes with a beautiful varnish – no matter which side it’s on, and at no extra cost. Kermit green and Oyster white. Licorice black and Ladybug red. Orchid purple and Kraft brown. The combinations are nearly endless, and there are plenty more options waiting for you. Watch your quote update itself as you design your custom box. Adjust the size or style and watch it update again. You’ll always know exactly what you’re going to pay. And we’ll also let you know how to save even more money by buying your custom boxes in bulk—again, updated right on the screen. Once you checkout, it’s just 5 days until your new custom boxes are in the mail. That’s so quick! What’s that? How quick is it? Well, it’s so quick, we hear instant coffee is feeling pretty jealous. All your custom boxes are made in Canada. Designed to withstand the rigors of shipping throughout North America, they’re created with high quality corrugate and use vibrant inks. They’re proudly Canadian, and when you see your custom boxes, you will be too. Proud, that is. We can’t help you with citizenship. 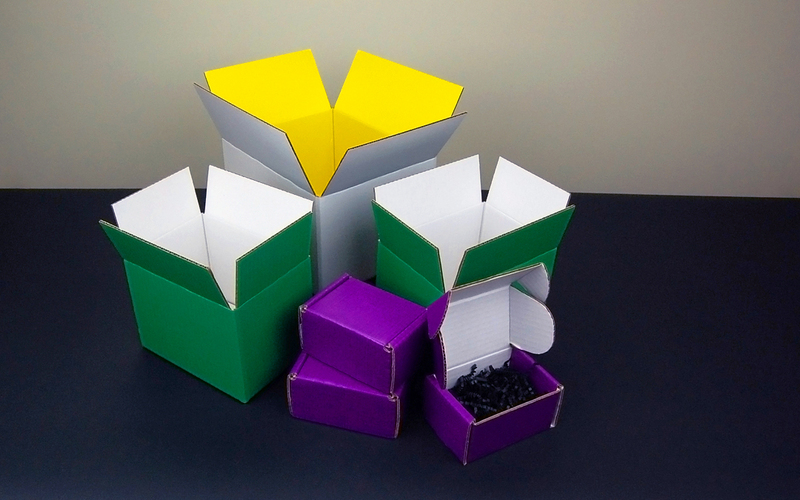 So whether you need 1 box or 20, squares or rectangles, purple boxes for everyone or different colors for all your nieces and nephews, custom boxes have all you need to make an impression. They’re designed by you, made by The Packaging Company. You won’t be disappointed. Visit our Custom Box Shop today!